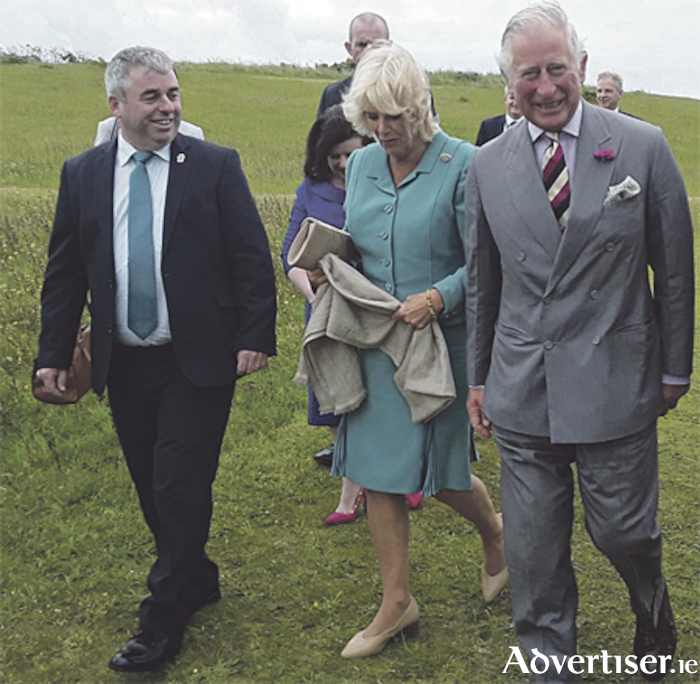 Minister of State for the Office of Public Works, Kevin ‘Boxer’ Moran received the royal treatment in Kerry on Friday last when he hosted their Royal Highnesses, the Prince of Wales and the Duchess of Cornwall at Derrynane House. In Ireland on an official two day visit, the Minister welcomed his royal guests to the family home and country residence of ‘the Liberator’ Daniel O’Connell. ‘A lawyer, statesman and politician, Daniel O’Connell was a strong advocate for human rights and equality for all. He achieved Catholic emancipation and also campaigned for the abolition of slavery, universal women’s rights, Jewish emancipation, and the repeal of the Act of Union. By empowering people peacefully, he helped lay the foundations for modern democracy,’ Minister Moran stated. ‘King George IV declared in 1829, immediately following the concession of Catholic emancipation, that O’Connell now inhabited the role of ‘the King of Ireland’. How significant then, that almost two centuries later, the next King of England and a descendent of George IV should undertake this truly historic visit to what was arguably ‘King Dan’s’ seat of power here at Derrynane. ‘Your Royal Highness, your presence here serves as both a significant reminder of the intertwined histories of our two countries and a powerful symbol of the bonds of friendship and understanding that we continue to strengthen and enhance’, the Minister added. The Minister noted that most of the O’Connell demesne is now included in Derrynane National Historic Park and under the excellent management of the Office of Public Works, the State agency charged with the care and upkeep of the most treasured heritage estates and properties in State ownership, before formally launching, together with his Royal Highness, the Prince of Wales, the Discover Derrynane Festival.